NYC, 02/11/2019, 6:00PM. Three-Cornered Moon (1933): the Great Crash of 1929. Difficulties overtake a well-to-do family in New York when they lose all their money in the Great Crash of 1929. Nellie has to tell her grown children that due to her bungled handling of their finances, the family has been wiped out by the Stock Market crash. Friend and family doctor, Alan Stevens, tells them they'll all need to eliminate their extravagant ways and get jobs. 131 min. Director: Elliott Nugent. 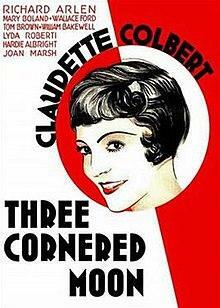 Starring Claudette Colbert and Mary Boland. Based on a play by Gertrude Tonkonogy Friedberg, the film reached No. 9 in the National Board of Review Awards top-10 films in 1933. Film critic Leonard Maltin identifies it as one of the "25 Vintage Movies You Really Shouldn't Miss". The Wall Street Crash of 1929, also known as the Stock Market Crash of 1929 or the Great Crash, is the stock market crash that occurred in late October, 1929. It started on October 24 ("Black Thursday") and continued until October 29, 1929 ("Black Tuesday"), when share prices on the New York Stock Exchange collapsed.